It was Timothy Asfal’s fingers that caught my eye when I boarded an overloaded 21 bus at Davidka Square on the way home to Talpiot. I could see them clearly because he was seated in the front row, on the aisle just behind the driver, clutching a plastic DVD box. Tim has the slender, agile digits of the artistic weaver he is, so finely-shaped that you want them to touch you. Tim and I have been friends since the 1980s, when we were both lonely and dreamy young men new in Jerusalem. I valued his company then because he had the wit of a sad clown and could see deep into my soul. Even then the beauty of his fingers stood out, but I barely noticed the way he looked then, or that the rest of his body was out of proportion. Now that he lives in Beit HaKerem we don’t see each other that often, even for a year at a time. And I admit that these days, when I run into him, I am taken aback for a moment. I notice all the things that friendship once led me to disregard. His body is thick, fleshy, and hirsute. His head is long and angular, with a protruding nose and ears that are two sizes too large. Maybe, in part, these physical flaws are even more noticeable now because when he was young he had hope. He could be ironic about love because he believed deep down that despite everything he would find it. Now, in middle age, he is unhappy and lonely. It was late on a Thursday afternoon in mid-June and the bus was packed back to front with shoppers from the Machaneh Yehuda shuk, the open-air produce market. Their baskets sprouted basil and leeks and the fragrance of raw carrots filled the air. I pushed myself onto the bus and, while I couldn’t get far, I managed to wedge myself right up against Tim’s seat, standing between a teenage couple grooving to their Ipods and each other and a Kurdish grandmother who sighed intermittently as if the entire world’s sorrows were on her shoulders. Tim barely smiled when he saw me. 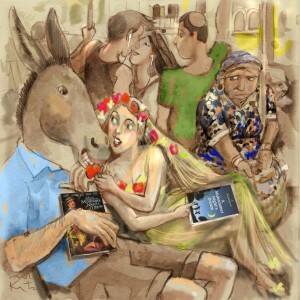 His head swung back and forth slowly, first to me, then toward the fair-haired woman in a blue summer dress who sat on the seat to his left, deeply absorbed in a paperback. His head halted just where he could see her out of the corner of his eye. At first glance, The Taming of the Shrew looks like the Shakespeare play most irrelevant to our times. I know, the butchery of Titus Andronicus is hard to swallow, but that play doesn’t end with a long speech about the virtues of hacking your enemies to pieces. Kate’s paean to wifely submission is certainly the most embarrassing classic English text that any actress today is ever called on to declaim. No one knows why the Bard chose to write this play. He lived apart from his own wife, so he had no reason to seek revenge. But I have a theory. I have no documents or scholarly tradition to support it, but I can cite in my favor a writer’s intuition. Shakespeare was a writer, I’m a writer. QED Shakespeare and Watzman think alike. In this play Shakespeare was protesting the female tyranny over literature. In his day, it was personified in Queen Elizabeth, which according to reliable sources such as the film Shakespeare in Love told him what plays to write and when. In our day, publishers cater to women because, they say, women purchase close to 70 percent of all books.